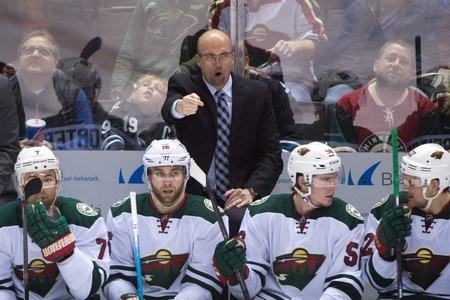 The Minnesota Wild have fired head coach Mike Yeo and named Iowa Wild head coach John Torchetti as the interim coach. The decision was made after the club dropped yet another game at home and posted a 3-12-4 record over their last 19 games. They’re 23-22-10 over the season, good for sixth in the Central Division, and general manager Chuck Fletcher knew it was time for a change – even after he recently told the coach his job was safe. In five seasons with Minnesota, Yeo put up a 173-132-44 record. He’s just the third coach in the franchise’s history and he took the club to the Western Conference semifinals in each of the last two seasons. Prior to his arrival in 2011, the Wild hadn’t made the post-season for three straight years. Owner Craig Leipold has a clear mandate for this team and early playoff exits won’t cut it anymore. With stars like Zach Parise and Ryan Suter signed to long-term deals and other quality players like Thomas Vanek and Mikael Granlund in the fold, the Wild feel they have a team that should be able to go the distance. There’s a lot of blame to go around in this franchise and the argument could be made that it’s not entirely Yeo’s fault, but that’s not how decisions are made in the NHL. The firing of Yeo has as much to do with shaking things up as it does assigning responsibility and one has to expect Leipold and Fletcher are hoping this will have a ripple effect. The Wild can still turn this thing around and Torchetti could help. The 51-year-old began his coaching career in the ECHL with the Greensboro Monarchs, where he served as an assistant. He signed up as a head coach with the San Antonion Iguanas in the CHL after that and won Coach of the Year honours in 1995. He’s also seen NHL experience as an assistant in Tampa and Florida, plus he was interim coach of the Los Angeles Kings during the 2005-2006 season. And in 2011, he crossed paths with Yeo as he was named his replacement behind the bench of the Houston Aeros. He’s also seen action in the KHL as the head coach of CKSA Moscow.